It’s been awhile since I wrote about a Coriolis piece, which is my fault, really. I’ve always admired their work since I first saw them back in 2010. I consider them producers of the finest balletic-inspired dance around, when most such dance is soporific to me. And I’ve been following their dancing individually in different contexts as well as their group work for the past couple years. 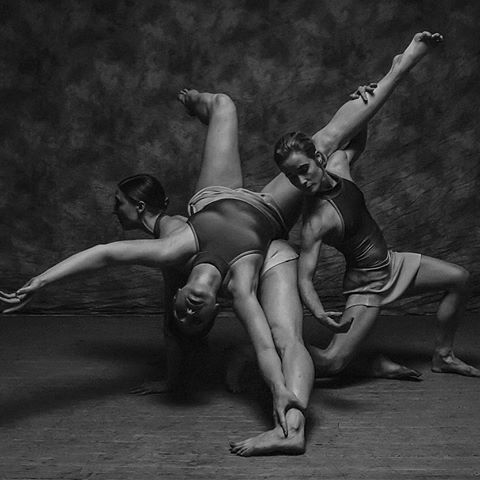 Their latest piece, Transit of Metis, is an evening of five pieces all choreographed by Natascha Greenwalt, one of the two co-founders of the group along with Christin Call. It’s a sumptuous programme that clarifies Ms. Greenwalt’s intellectual and stylistic contributions to the group in a way quite unlike their other evening-length shows. Though the evening is a potpourri of pieces from different times and events, many of which I have seen before, Ms. Greenwalt ties all five of the pieces together with an overarching narrative structure–namely, the story of Metis and Zeus. Yet these pieces are not strictly narrative by any means. If anything they tend toward poetic interpretation. In Act One, the first three pieces form an amalgam, two pieces of which I have seen other places. The opening duet between Ms. Call and Thomas Phelan, at this  we part, I had not. I read this piece quite simply as a tale about the end of a relationship, though certainly one can extrapolate it as an evocation of the love of Zeus and Metis. Even before the dance begins, however, the stage is filled with bodiless lights that move eerily and wonderfully through the darkness of the stage. These tiny lights offer only the barest flashes of the dancers gathering. The device reminded me of nothing so much as fireflies on a summer night, and in view of the story of Metis, who turned into a fly before she was swallowed whole by Zeus, offered a metaphoric introduction to the dance. While Mr. Phelan and Ms. Call dance, he slowly plucks her feathers (represented by the veils in her tulle garb) and finally she is grounded. It is short and simple, and better for both those qualities. As I watched, I began to notice how Ms. Call has become a much, much better actor than when I first saw her. She has always been a fine, lissome dancer, capable of great expression with her movements. Here, however, her face and hands have become truly expressive in themselves. I wonder how much of this stems from her recent experience as a dance filmmaker with her short, Voluntary Caesura, and having to live with camera truth throughout that process. Regardless, it has given Ms. Call an even nobler stage presence than before, and makes her remarkably pleasant to watch. The next piece in the show, if one reads it as a continuation of the first, is not Metis’ grounding, but her burial. This piece, Estranged Incandescence professes to be a funeral but it’s obviously more complex than that. It begins with the lovely soprano Sarah Davis emerging from behind the large transparent veil at the rear of the stage. Singing Puccini’s O mio babbino caro as she glides slowly across the stage, she picks up all of the veils from Ms. Call’s earlier duet, gathers them together into a black ball, then leaves the stage. Then the ceremony begins. The funeral is, as one would expect, a deeply emotional piece. It begins quite somber, in arranged processional lines that gradually fragment into duets within a loose grid formed by the ensemble. Since the evening is about transformation, it makes sense to treat the most mysterious transformation of all: the metamorphosis of life into death. It is perhaps telling that this is a dance for the female dancers only. And though it begins quite soberly, there is throughout a restrained emotion not of sorrow but of release, and this release slowly loses its restraint and becomes the subject of the dance as the dancers get faster, brighter, and less earthbound. By the ending of the piece, the dancers even achieve something that is, if not quite an expression of joy, a celebration of life. I found it all profoundly moving, Ms. Greenwalt’s work at its most emotional. The closer for act 1, Tethered Apparitions is one of the pieces I’d seen before. It starts (and ends) with two dancers straining to cross the stage laterally while two other dancers on the ground hold their ankles. But the piece gradually transforms the meaning of these movements. At first this movement speaks in a mood of control. By the end it becomes something like support, if not outright liberation: these “tethered apparitions” need their tethers for their identity, not to limit it but to define it. Being found, that identity leads to meaning as a pair, or a couple, or a partner, or…. Having seen this piece before I concentrated on the individual dancing, especially Ms. Greenwalt’s own dancing and her duets with partners both male and female. I love watching Ms. Greenwalt dance. Despite her obviously balletic training, she infuses movements with her own distinct style. When so much of ballet is about the feet, there is something she does with her upper torso that’s especially interesting to me, a particularly informal yet deliberate way she embodies the movements of her characters. It also highlights the contrast between Ms. Greenwalt and her partner and co-conspirator Ms. Call. They are clearly different from each other, and yet their partnership seems perfect. Where Ms. Call is very formal with her movements, Ms. Greenwalt is often informal, drawing more often from vernacular movements. At the same time, Ms. Call tends to be more experimental with her choreography, while Ms. Greenwalt remains quite traditional. And yet in Act II the dancers lose their traditional pointe shoes they have worn up to this point and don short brown stockings. As if to stress the point, both closing pieces are much more playful. Transit is especially so. It shows Ms. Greenwalt mining that vein of witty, kooky, silly fun that I love so well in her work, a trait uniquely hers within the company, though every so often a guest choreographer will create a similar work for them (such as the delightful Frenchy, Texas, Fritzy and Helga from Rainbow Fletcher). It’s somewhat difficult for me to describe Transit, but it begins with violinist Julia Gish-Salerno playing alone on the stage at her music stand. Then Katherine Murphy, Marissa Quimby, Christin Call, and Ms. Greenwalt — the heart of the Coriolis company — come out onto the stage and begin something that reminds me of a more orderly version of a beginning dance class, where students are encouraged simply to play around with space so they can find out what it means and how to use it. Here each dancer picks up from the others, and clearly they listen to each other in a way hapless students rarely accomplish. They run to and fro. They lope about diagonally. They mirror each other’s movements. They trade roles of support. Yet the game structure of the piece, and its informal grid, remains. It’s fabulous to have such a light-hearted piece of pure play amid the sobriety of the rest of the evening, and it clearly rubs off on the dancers. I believe I even saw Ms. Greenwalt smile at one point during her dance, which is a Coriolis rarity for sure. The closing piece, Ms. Greenwalt’s world premiere of Athena Unfettered, is about pure delight. The playfulness of the previous piece turns into a dance that is almost bacchanalian. The entire cast returns to the stage. Radiant with glory and joy, vocalist Sarah Davis too comes back on stage, singing her vocalese, dressed like a Greek goddess, moving among the dancers and guiding them toward freedom. It’s effusive and beautiful, and shows how thoughtfully optimistic Ms. Greenwalt’s work can be. All together the pieces form a lovely evening. The full range of Ms. Greenwalt’s interests are present here: myth, transfiguration, psychic violence, play, wit. And she has such a remakable supporting cast. It thrilled me to see Lara Seefeldt on stage again, outside of her burlesque roles for Lily Verlaine and Jasper McCann and the confines of her work with Whim W’him. Similarly with Thomas Phelan, whom I really wish I could see more often. Even Mariko Nagashima and Hannah Simmons whom I sometimes find to be icy and stiff both rise to the occasion here, clearly enjoying themselves — as they should. The live music by Ms. Davis and Ms. Gish-Salerno adds a special kind of transcendent mood as well, playing against the expected music, composed and pre-recorded. There is nothing like live music, and more importantly, live musicians in a theatrical dance setting. Having them directly interact with the dance, too, helps lift the bandstand and the dance both. I wish more companies would explore this power. I promise it won’t be so long next time before I write about Ms. Greenwalt’s work again. She has become one of my favorite dancers over the years, and I am truly happy to see her finally get her due as a choreographer. It is well-deserved. I look forward to more.